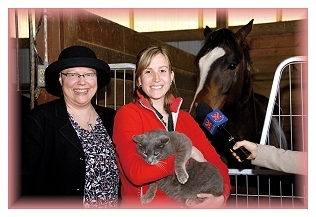 Morgen Espe is an animal communicator who has been recognized and featured on NBC and CBS news. She shares her gift of communication with the animal kingdom and takes us into the minds of our furry friends. With a deep understanding of animals’ feelings and thoughts, Ms. Espe teaches classes and holds seminars on the fundamentals of conveying messages to the animal world. On May 15, Golden Year 5 (2008), members of The Supreme Master Ching Hai International Association arrived at Camp Kern in Lebanon, Ohio, where beautiful horses and other interesting caring creatures reside. It was an amazing experience to learn what was on the minds of some of the animal residents of Kern farm and very touching to know how they feel about us. They truly love humans and treat their caretakers as their parents; for example, calling many of them “Mommy” or “Dad.” We discovered that one of the most important gifts animals want to share with us is unconditional love. People who have animals feel this loving bond and it was exciting to find out that it really does exist! The animals love their human companions wholeheartedly regardless of what type of car they drive, how they look, what they do for a living, or their income level. The director of the YMCA Camp Kern, Rachel Murphy, said that their summer camp has an outdoor education program which teaches kids and adults how to better communicate and learn about their animals’ lives. Morgan has also written a beautiful book called Whispers of Heaven, which is a collection of excerpts from what the animals have said. The animals are here on this planet to show us unconditional love, truth and honesty. They have explained to Morgan that they only respond and deal with honesty. They have also most assuredly said that they all have souls and even come into this world following the same person that they’ve been with in another lifetime! Morgan teaches us that we all can communicate with animals. Through this communication we can learn insightful wisdom from them and live with harmony and understanding. Animals are visual and they can understand our thoughts and feelings through the pictures we send in our minds. Morgan says this non-verbal communication can open a connection between humans and the animal world and bring a deeper awareness of how much love we can experience with the animals in our lives. Morgan has also experienced the joy of reuniting lost animals with their caretakers. Through this non-verbal communication, animals are able to share their experiences as well as their location and have been guided home safely with the use of the pictures in their minds. Morgan wants us to know that everyone can communicate with animals. How? With the use of pictures and positive affirmations, not using any negative words or thoughts which include no, don’t, can’t or won’t. Sending positive messages of what we want and not of what we don’t want to the animals will help them to understand our wishes and learn how we would like them to interact with us. For example: If you see a deer on the highway, we might panic and say, “Don’t go out onto the road.” This confuses the deer because of the negative word “don’t.” The deer will understand that your desire is for him to go onto the road. That’s one reason they may freeze on the highway when a car approaches. They may be thinking, “You want me to do what! ?” A better message to send would be, “Keep your feet on the green (grass), the green is safe; or turn around and go back into the woods, back into the trees. The road is a very dangerous place; the trees are very safe.” That’s a really firm visual for us and for them to receive. It was an amazing pleasure speaking with Morgan and learning how to communicate with our co-inhabitants of this world. May God bless Morgan and all human beings who desire to open their hearts and share the love and understanding by being able to better communicate with the animals in our world.